If you never heard of automated builds before, here is a short description of what they can do for you. In the time between version control commit and the email from my build machine i can keep working on my game and don't need to worry about building anymore. This is pretty great! So what do we need for automated iOS builds? TeamCity - the sofware for out automated builds. good news: it's free! Side note: In theory, the build machine can also be the machine you develop on. You will notice performance drops during the build time though. This step is pretty straight forward. Download and install TeamCity, install Xcode and make sure that your CodeSign elements are setup correctly. TeamCity has great tutorials for the initial setup. Follow those until you are ready to set up your first project in it. 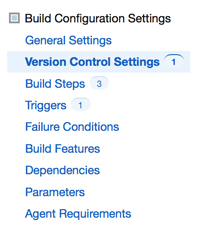 As the first step the Version Control Settings need to be entered. First select the type of VCS and then follow the necessary steps. TeamCity tells you when the settings seem to be ok. I divided the build process into 3 separated steps. Add a build step in TeamCity and choose Command Line from the Runner Type drop down menu. Also choose Custom Script in the Run dropdown menu. "-batchmode" - this tells Unity3d that this is a build where no human interaction is possible. There will be e.g. no popups. "-projectPath %teamcity.build.checkoutDir%/path/in/checkout" - we need to tell Unity3d the path of the project we want to build. %teamcity.build.checkoutDir% links to the directory in which TeamCity checks out the project from the Version Control system you specified. You can add a deeper path afterwards if your project is not in the VCS root directory. In order to execute this step without build errors we need to look at -executeMethod CommandLineBuild.buildIOS again. This points to a method in a class that needs to be part of the Unity3d project. In this example the class is called CommandLineBuild and contains a static method called buildIOS. Important: the class needs to be placed in the Editor folder of your project. Otherwise you get compiler errors. [MenuItem(@"Build/BuildIOS")] - this is not required but it helps us to test the script in Unity3d rather than running into compile errors later on. var scenes = collectBuildScenes(); - we need to find and store all scenes from our project before we can build it. this method does it for us. BuildPipeline.BuildPlayer(scenes, "ios", BuildTarget.iOS, BuildOptions.None); - this starts the actual build process. We provide the collected scenes, tell the builder to save everything into a folder named ios and also that we want an iOS build. The result of this first TeamCity step should be an Xcode project. We handle that in the next step. Add another build step to your TeamCity project. Again use Command Line as runner type and Custom Script in the Run menu. xcodebuild -project %teamcity.build.checkoutDir%/path/in/checkout/ios/Unity-iPhone.xcodeproj -target "Unity-iPhone" -configuration Release clean build DEPLOYMENT_POSTPROCESSING=YES CODE_SIGN_IDENTITY="iPhone Developer: Your Name"
-project %teamcity.build.checkoutDir%/path/in/checkout/ios/Unity-iPhone.xcodeproj - we need to tell Xcode where our project is located. Note that this is the path from the previous step PLUS the ios subfolder in which we built our Xcode project. CODE_SIGN_IDENTITY="iPhone Developer: Your Name" - this is important for deployment later. the project needs to be signed with your developer identity. Make sure that your code sign certificates work on the build machine before you work on this step. The result of this step is an .app version of your Xcode project. mv -f %teamcity.build.checkoutDir%/path/to/checkout/ios/build/game.ipa /Users/youruser/Dropbox/Public/latest_version_of_my_app/ - this moved the resulting IPA to a folder in the Public folder of Dropbox. I will explain later why we do that. The result of this step is an IPA file. In theory you could copy this file to your device and run it already. But this is another step we can automate! I will explain this a bit later. To save even more time, we want to trigger all those build steps automatically every time we commit a change to our VCS. The last step frees us from using cables to transfer the IPA to our mobile device. The cheapest method for this is using Dropbox. In step 3.c we moved the IPA file to a subfolder in our Public Dropbox folder. We need to add two more files to this folder in order to make everything work. if you want to, you can change the other values as well. this is optional though. Create a file called index.html in the same folder as your IPA and your manifest file. On https://gist.github.com/1051163 someone uploaded a template for this file as well. Now you can open the public link to your index.html file on your mobile phone and install the app with just one click! Automated builds take some time, depending on your project size and how fast your build machine can build everything. To work around that issue, TeamCity can send E-Mails once a build is finished. This can be enabled in Administration > Email Notifier. After you get the mail, open up your index.html and install the latest version. Last addition: it is smart to bookmark the link to the index.html on your mobile device home screen. This way you can access it with on tap. I hope this article brings a bit of light into a topic that is dreaded by many small developers because it looks very complicated when you start reading about it. If you have questions contact me on twitter ( @iossif ) anytime.